Will Casillas emulate Combi and Zoff? Not since Gianpiero Combi received the Jules Rimet trophy from none other than Mussolini in 1934, and the 40-year-old Dino Zoff hoisted the World Cup in 1982, has a goalkeeper had the pleasure of holding aloft the most coveted trophy in the world of sport. Will July 11, 2010 bring us a third goalkeeper to do so? He is my favourite and not only because he plays for my favourite club. Iker Casillas has kept a not-so-clinical Spanish side in this tournament. There is no doubt about that. For me the most telling save was in the dying seconds of the match with Paraguay, off the boot of Roque Santa Cruz. After watching him closely for years on television playing for Real Madrid, I couldn't believe my eyes when I watched him in action, up close and personal, three rows away from the beautiful pitch of the Greenpoint stadium. It was Portugal vs Spain on June 29. Since he took over from the injured Cesare Sanchez in the Champions League triumph over Bayer Leverkusen of 2002 and famously protected their slim 2-1 lead, he's been number 1. For the team, for the fans, when discussing the starting line up, the goal keeping slot was always a solved problem, a wave of the hand -- its gonna be Casillas. Saint Iker. Watching him live, you couldn't take your eyes off him. There is a quiet confidence as he goes through the motions of warm up, meeting each cross with languid precision. He dives, he tumbles and rolls, he stretches every sinew to reach that impossibly high ball, and yet he's not breathing hard. His physical stature and its elasticity, his mental calm and its solidity all seem attuned towards making one of the best ever goalkeepers I have ever seen. Not only does this master have all the experience of big matches, I cannot think of a more prepared body and mind; he also has practice of lifting massive trophies! If he does lift the cup tonight, he'll know exactly how to. A few days more than exactly two years ago, he lifted the UEFA European Championship -- the first goalkeeper captain to do so, when Spain overcame Germany 1-0. 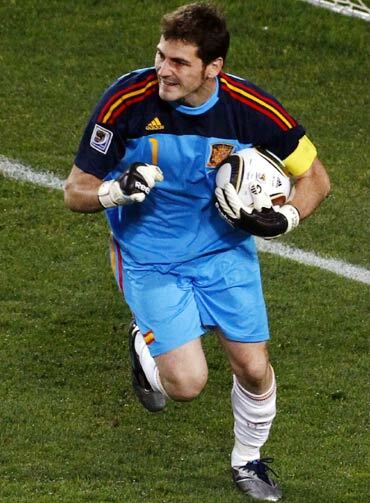 There is also the sporting side to Casillas that you cannot help but notice. As Spain defeated Portugal at the Greenpoint, the most visibly distraught player was Portugal's goalkeeper Eduardo. Within seconds Casillas had crossed the entire length of the pitch and was consoling Eduardo. He only celebrated later. If tonight the footballing Gods smile down on Casillas, there is no doubt that he deserves it; if they don't, I am sure they wouldn't find a captain who can handle it better.